To Cite: Jesudian G. Single Incision Lift Laparoscopic Surgeries [Sills]: Taking Modern Surgery to the Poor, J Minim Invasive Surg Sci. 2014 ; 3(1):e11465. 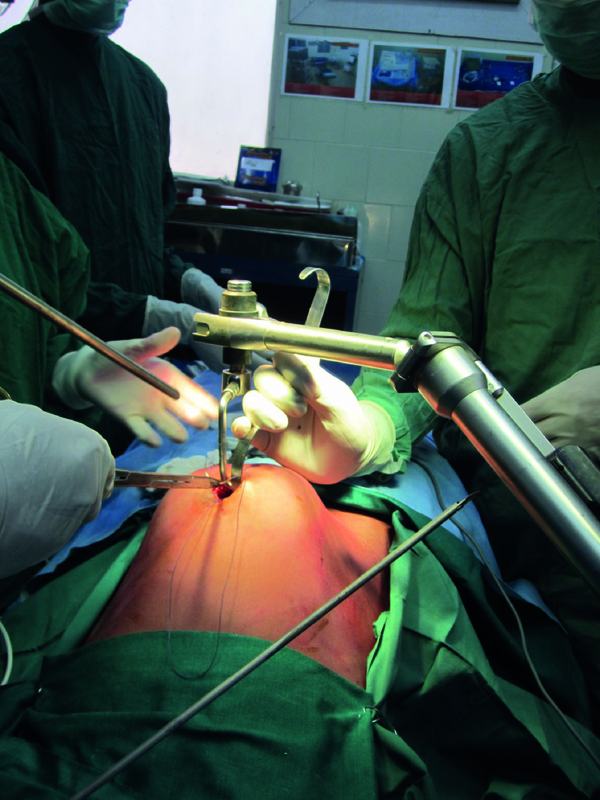 Laparoscopic surgery is now an integral part of the operative repertoire. Single-incision laparoscopic surgery (SILS) is a new technique developed for performing operations without a visible scar. Pneumoperitoneum, as a necessary precondition of laparoscopic procedures, represents the restriction of the surgeon's freedom of movement and can lead to rare but typical complications. The Single Incision Lift Laparoscopic surgery is advantageous. We presented our experience of 194 surgeries carries out this method since March 2012. This procedure is ideal in rural areas because it is cheap, safe and simple. Today, laparoscopic surgery is an integral part of the operative repertoire. It has broadened gynecological and general surgery by continuously providing new indication areas. Laparoscopy is regarded as the major trend of the century and a revolution in surgical technology. Single-incision laparoscopic surgery (SILS) is a new technique developed for performing operations without a visible scar and has become an area of active research and interest within general surgeons’ community. SILS may further reduce the trauma of surgery leading to reduced port site complications and postoperative pain. Despite many advantages of minimally invasive surgeries like less pain, short hospital stay, less blood loss, etc., the laparoscopic surgeries are not popular in rural areas because of its high cost. In recent times, however, the problems associated with laparoscopic surgeries with gas have been the subject of discussions and this leads to the development of Gas less laparoscopic surgeries. We described our experience with Single Incision gasless Lift Laparoscopic surgeries that has the advantages of laparoscopy and open surgeries and does away with the drawbacks of laparoscopic surgeries. We presented the feasibility of the procedures in rural areas. From March 2012 onwards until August 2013, 194 surgical procedures were carried out in seven mission hospitals in South and Northeast India and in one Medical College. Table 1 gives the list of surgeries carried out. The Lift apparatus is fixed to the operating table. Shoulder braces are used to prevent the patient from sliding back. The incision then holds the lower end of the umbilicus with two towel clips and cuts through the lower half of the umbilicus. The incision is widened using the finger after entering the abdominal cavity to comfortably insert the index finger. The abdominal portion of the Lift apparatus is inserted and initially the finger is used to make sure that no bowel or omentum is caught between the Lift apparatus and the anterior abdominal wall. The abdominal wall is then lifted under vision. The Lift apparatus is designed so that it lifts the abdominal wall primarily lifting the umbilicus to about 10 centimeters and lifts the recti muscles and does not extend beyond it so that there is no injury. There is sufficient space to operate and most of those who see just the television picture cannot believe that gas is not used for the surgery [especially during the two live surgical workshops that were held]. The umbilical hole made easily the index finger of the surgeon accommodated and is about three cm in diameter. 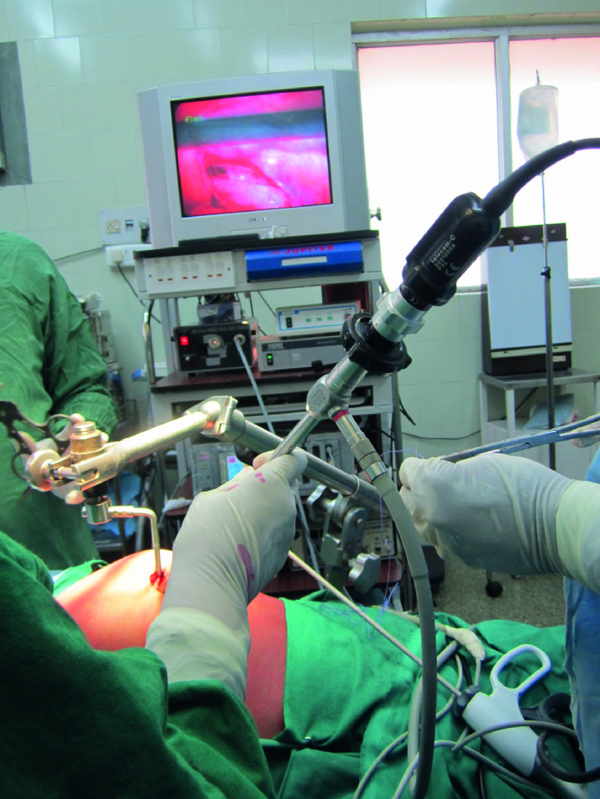 Combinations of open and laparoscopic instruments were used for the surgery. Since there is no gas, larger instruments could be passed one at a time conveniently. The technique was mostly useful for surgeries like Appendectomy and evaluation of infertility. Laparoscopy assisted vaginal hysterectomy, ovarian cystectomies needs a little more time for learning. Other surgeries require longer learning curves. The exposure is not as good as that of regular laparoscopic surgeries except in thin patients. However, it is sufficient for performing the surgeries. The complications including infection in one patient and prolonged ileus in four patients with appendicitis was probably due to the peritonitis rather than the method used for removing the appendix. Difficulties included the ometum or bowel getting in between the anterior abdominal and the lift in obese patients. However only after making sure nothing was there, the abdominal wall was lifted to the full extent. In 1902, Georg Kelling performed the first laparoscopic procedure in dogs and in 1910, Hans Christian Jacobaeus of Sweden reported the first laparoscopic operation in humans (1). In the ensuing several decades, numerous individuals refined and popularized the approach further. In 1981, Semm, from Germany, performed the first Laparoscopic Appendectomy. Semm established several standard procedures that were regularly performed, such as ovarian cyst enucleating, myomectomy, treatment of ectopic pregnancy and finally laparoscopic-assisted vaginal hysterectomy (2). Pneumoperitoneum, as a necessary precondition of laparoscopic procedures, represents a restriction of the surgeon's freedom of movement and can lead to rare but typical complications. Compared to the traditional procedure with a CO2 pneumoperitoneum, the results of the first gasless procedures demonstrate the potential advantages (3). In addition to very rare risks like air embolism that could lead to death and other complications, there are several physiological changes that occur during the gas laparoscopic surgeries (4). These prolong recovery period can cause post- operative adhesions, and shoulder pain, etc. Hence gasless or Lift laparoscopic surgeries were promoted. However, it did not become very popular because of the limitations as compared with the regular laparoscopic surgeries using gas. The instruments developed by Dr. Daniel Kruschinski and team for gasless Lift laparoscopic surgery (5), are sturdy, less expensive, easier to maintain and hand instruments are similar to traditional open surgical instruments. The first report of single incision laparoscopic surgery (SILS) was made by Navarra et al. who performed a SILS cholecystectomy in 1997. Despite the lack of evidence demonstrating any superiority of SILS, it is being increasingly performed. Byron F. et al (6), reported a study which had compared the performance of standardized tasks from the Fundamentals of Laparoscopic Surgery (FLS) program using either the LAP or the SILS technique. His study had demonstrate that performing tasks using SILS techniques is more technically challenging even for surgeons with previous SILS experience. However, the use of familiar open surgical instruments (Figure 1), lack of cross –over of instruments and that the instruments could be passed one at a time (Figure 2) make it easier to learn. For rural areas, the advantages of short stay, less pain, fast recovery, ability to perform under regional anesthesia , less expense and an easier learning make it an ideal procedure for taking modern surgery to the poor and the marginalized. Implication for health policy/practice/research/medical education: The regular Single incision laparoscopic Appendectomy is considered as an advanced difficult procedure with a recommendation that only few trained persons do it. However the procedure of Lift laparoscopic surgery makes it easy so that most of the surgeons can learn and many rural patients can benefit. Authors’ Contribution: The author either carried out or helped the other surgeons do the surgeries being present for all the surgeries. Funding/Support: There is no funding support. 2. What makes the difference? Gasless Lift laparoscopic surgery.